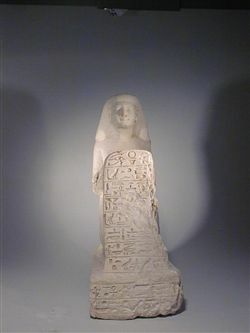 The statuette represents a man in a kneeling position holding a stela in front of him. Both his hands are on top of the stela. The man wears a long, smooth robe; his feet and ankles are visible. He wears a smooth wig that does not cover his ears. The statuette has a base and a back pillar. The whole statuette has been polished. (9) [...] in the course of every day.